The Glock 22 is a famous handgun for its reliability, durability, and general lack of required maintenance. 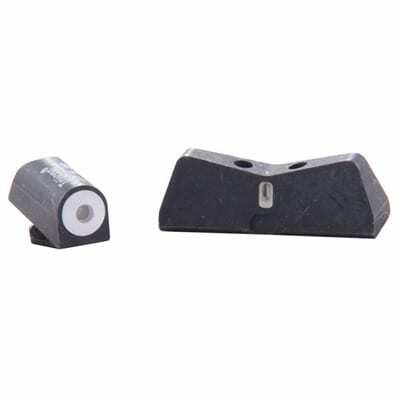 One aspect Glock users would often like to improve, however, is the stock sights. They work fine for basic targeting, but you’ll need something better if you’re serious about accuracy or shooting in anything short of ideal conditions. With that in mind, let’s review the best Glock sights for the year! ​The stock sights on a Glock are plastic. Enough said, right? If you use your Glock often, it’s only a matter of time before the stock sights are damaged. Don’t wait until this happens to upgrade your sights! ​Glock sights exist for just a wide range of accuracy levels and shooting conditions. The stock sights work well if your target is a tin can. If you want to shoot far away targets, or moving targets, invest in a better sight. ​The stock sights are U-shaped in the rear, with a solid I-shaped front sight. If you didn’t know any better, you might not think this is a problem. However, this is an unusual and unintuitive viewing pattern that doesn’t work well with how the eye naturally focuses. In short, you’ll have an easier time calculating what you’re seeing with a better sight. ​Glocks are incredibly popular, meaning there’s a sight for any need, personality, and budget. ​Do you need to shoot from afar? Do you need to shoot at night as well as daytime? Is your vision poor? There’s a Glock sight out there for any condition. ​Lastly, with so many sights out there, finding one in your budget is easy! ​This is a big one. We usually review only the best sights for any budget, so most of our sights are high-quality. You’ll want to avoid plastic in general. That said, there will always be a range in durability and you’ll want one that will at least last you for many years. You know your habits best: if you shoot a lot and in all types of conditions, you’ll want a very durable sight. ​We love warranties and so should you. If your sight breaks, you get a refund with a warranty. The pricier the sight, the more important a warranty is unless you happen to be swimming in money. ​Some sights are specially-designed for excellent short-range shooting. They’re fast, accurate, and perfect for this use case. Others are more versatile. Still other excel at a long range. ​If you intend to use a suppressor, be sure your new sights are tall enough to accommodate them. Likewise, taller sights that accommodate suppressors might not fit in your holster. If you don’t have a suppressor, you can safely ignore these two points. Nearly all standard sights will work with any given holster. Now that you know you need to update your Glock sights and you know what to look for, let’s dig into the reviews! We’ve rounded up the best and most popular options on the market for 2019. We’ll be looking at the pros and cons of each, as well as what type of user each sight would best accommodate. XS Sight Systems makes these sights available for just about any gun, which is a good thing because you’ll probably want them on every handgun once you try out the DXT Big Dot Sights For Glock. When used properly, these sights instantly improve your accuracy, particularly with follow-up shots. The idea here is a sort of lollipop-shape, with a straight line in the rear and a large dot in the center. This minimizes the time between drawing your Glock and targeting. After a short period of getting used to your new sights, you’ll be rapidly engaging a target at up to 25 yards very easily. Beyond 25 yards, these effects start to fade somewhat, although you will still be able to hit your target. DXT Big Dot Sights work in any light conditions. While the sights are housed in stainless steel, the rear sight is a tritium bar with a highly-visible white border. The front sight is a tritium dot surrounded by a white ring. If you’re new to picking sights, tritium basically acts as a radioactive vacuum, sucking in all available light. The effect is somewhat like road signs that have that glimmer effect while you’re driving. In short, these sights are visually-designed to draw the eye, and the tritium sharpens your focus quickly. For all these reasons, DXT Big Dot Sights are hands-down the best value for concealed carry and self-defense. They’re very affordable, too. If you’re just looking for a solid upgrade or self-defense is your primary goal, these are the best sights for your money. Anyone looking for an upgrade to their stock Glock sights without a strong preference for a niche product will love XS Sight Systems. Perfect for concealed carry or self-defense, they make an excellent and affordable alternative. A Standard of Many Law Enforcement Agencies. Choose Your Outline Color, All Color Blind Friendly. Three Variations to Suit Your Needs, Including Support for a Suppressor. Do you need often to shoot at night or in poor lighting conditions? Trijicon has you covered with these high-visibility sights. With glow-in-the-dark photoluminescent paint and a tritium-filled glass lamp, you’ll have excellent illumination any time of day. Additionally, a U-notch rear sight helps improve your focus on the front sight. The rear sight is also at a subdued angle, minimizing glare. These sights are available in three sets. Bright & Tough, HD, and HD XR are your options. Bright & Tough lacks the photoluminescent paint and angled rear but is compatible with a suppressor. HD is your basic model that includes these features but is compatible with a suppressor. HD XR brings a thinner front-sight post, increasing your field of view, and is also compatible with a suppressor. Thus, you can choose whatever configuration most appeals to you. Generally, we think the HD XR model provides the best optics, while the Bright & Tough provides the best versatility. The stripped-down Bright & Tough is a standard issue of many law enforcement agencies, though, so don’t doubt they are powerful! The lack of an angled rear ensures that it will work with a variety of other configurations, including a suppressor. We also appreciate that there are color options available for each model, so that you can choose whatever outline color you prefer. Overall, these are the best sights for low-light or no-light shooting, with a great range of options. They’re affordable, too, making them a great choice! Some of the best sights out there, the Trijicon Night Sight Sets for Glock Pistols provide a wealth of options. Regardless of how you customize them, these sights are a great value and provide unparalleled nighttime performance. A while back, laser sights were considered silly or excessive by many gun owners. Times have changed and lasers are a big deal. You should be aware that laser sights help not only with low-light conditions, but also when shooting from awkward positions where getting a line-up with iron sights is difficult. Among laser sights, the Viridian Essential Red Laser Sight is the best. First, the red laser is preferable to green lasers as it drastically improves battery life while lowering the cost. Green is slightly better for daytime shooting, but not enough to offset the benefits of a red laser. Viridian’s red laser is darn good, too. It’s a precise 650nm wave, providing the sharpest and most concentrated beam available within a reasonable budget. Visible up to a full mile at nighttime and 25 yards during the day, you can trust that it will always help you find your target. It lasts up to six hours of continuous use, with a five-minute automatic shut-off. If six hours sounds short to you, now you know why we don’t want to cut that in half with a more expensive green laser! This automatic shut-off is also not standard and greatly helps enhance battery life. It is made from a high-strength, thermo-molded polymer, providing great durability at a feather-light .78oz. In case you’re new to guns and didn’t know, laser sights are perfectly compatible with iron sights, as they install to a different area. These make a great complement to your Glock, and with all these benefits and at such a low price, there’s no reason not to invest in them. Laser sights are excellent for improving both low-light targeting and are handy when shooting at an awkward angle. With great battery life and at a very reasonable price, the Viridian Essential Red Laser Sight is a wise investment. Red dot sights provide premium accuracy and fast targeting, but it can be difficult to find this performance within a reasonable budget without sacrificing quality to the point that you’d be better off just getting a great iron sight. 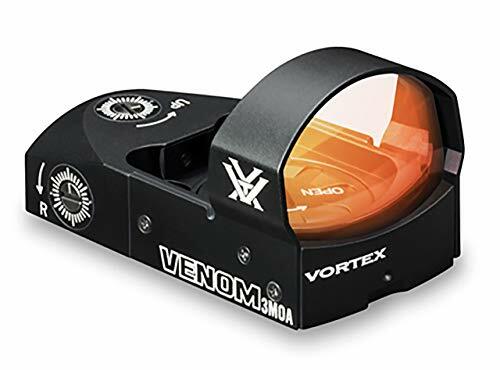 Vortex Optics Venom Red Dot Sights provide high-quality without breaking the bank. Available in three MOA dot and six MOA dot variants, you’ll enjoy very rapid target acquisition and precision. This opens your shooting to a much longer range than traditional iron sights and is suitable in all lighting conditions. Additionally, Venom sights include an auto-brightness mode that senses ambient light to control the intensity of the dot’s brightness. This is a premium feature for this price point and works very well. You can also easily adjust the dot intensity with ten available levels, easily accessible on the left of the unit. You’ll also get one MOA windage and elevation adjustment. All this is housed in a study aircraft-aluminum housing. Multi-coated lenses resist smudging and condensation. It also is designed so that you can easily access the battery without removing the sight—while this is usually the case, it’s good to be sure so that you save yourself a major annoyance. Overall, this is an excellent quality red dot sight with great, premium features at a very reasonable price point. If you’re looking for a red dot sight, the Vortex Optics Venom Red Dot Sights provide premium features and durable build quality in an affordable product. If you really want a red dot sight but aren’t willing or able to spend a lot of money, Ade Advanced Optics has you covered. 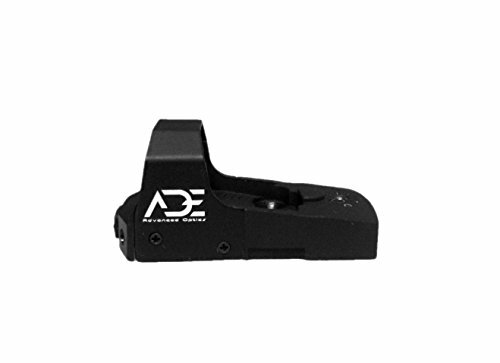 While we think the Vortex Optics Venom Red Dot Sights provide incredible value for the price point, Ade Advanced Optics slashes the price considerably to make red dot sights affordable for anyone. What’s more, this is still a quality sight, not some piece of junk. In fact, you’ll get some amazing features for such a bargain sight. Enjoy five brightness levels and an optional green dot. Lenses are precision-grounded with parallax correction for better targeting than any other bargain red dot sight. You’ll also get windage and elevation adjustment. The power switch is located in the front of the sight, which many users find preferential to the side. Speaking of power, because this sight is a mini red dot, you’ll get an incredible three months of battery life. Yes, that’s when it’s on all the time! This almost becomes a liability, as users may just leave the sight on or forget that they’ll eventually need a new battery. Here, an automatic shut-off would be useful, but it’s hard to hold its absence against such a low-priced model. Overall, this is a budget solution for a red dot sight. Encased in a rugged polymer, it’s durable but not unbreakable. You also won’t get features that will blow anyone away. 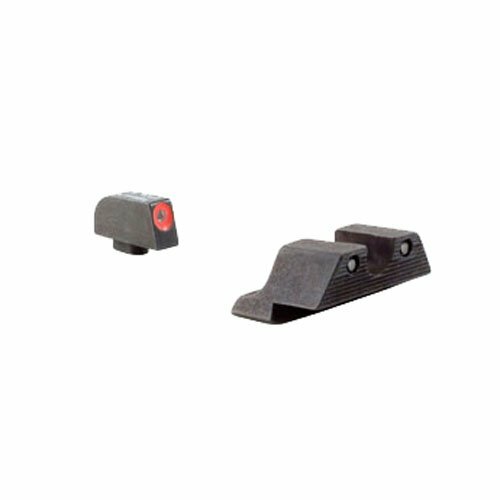 However, you could also get several of these red dot sights for the price of the average red dot sight, and it’s of comparable quality. As long as you have reasonable expectations, we think you’ll be very satisfied with this budget mini red dot sight. As long as you understand that this isn’t the cream of the crop, you will be thrilled at this shockingly low-priced red dot sight, which provides all the basic must-haves of a red dot sight to the masses. While we’re mainly reviewing replacements for your stock iron sights, it’s definitely worth noting that sometimes factory sights are preferable. Because they’re massed produced on such a large scale, they’re incredibly affordable. Wise Glock owners will be sure to pick up at least one OEM set of sights for an affordable backup, should they never need them. Also, not all factory OEM sights are the same. If you have an older Glock, your stock sights might be outdated. The current generation of stock sights features an adjustable windage and elevation, along with a more rugged polymer construction than earlier sights. Even if you feel that the stock sights you already have are just fine, it only makes sense to spring for a low-cost upgrade. Replacement sights are easy to install, often much more so than more advanced sights. Because they’re so ubiquitous, support and guides for stock sights are everywhere. They also have the advantage of being compatible with nearly any Glock handgun, not just the 22. If you want a low-cost, easy upgrade over your older model stock sights, or just want the peace of mind of having some spares, don’t discount the idea of getting some factory sights. Without being anything special, the modern factory stock sights for your Glock are an improvement over older versions. At a very low price, they’re an affordable, easy to upgrade, and wise owners will keep some spares handy at all times. Those Who Want Something More Advanced Might Find Their Money Better Spent on Something With the Advantage of Electronics. Ghost rings are relatively new, the main appeal being the thinness of the rear ring, with a slightly thicker front. Having a thinner rear ring helps to minimize occlusion of your target, whereas a thicker front allows you to more easily focus your eye on it. 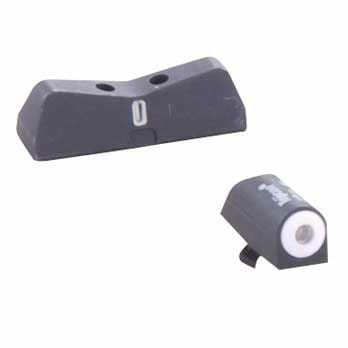 Thus, they can be an effective solution for those who like iron sights but want greater accuracy. These ghost rings are enhanced with tritium, which as we’ve explained help to draw in light. This makes them ideal for any lighting condition, without the introduction of fiber-optics or electronic components. They are also green on both the front and rear, which is more visible in all lighting conditions. The result is a balance—you don’t have the fuss of something more advanced than an iron sight, but you do get the benefits that come with something fancier, such as a red dot sight. This setup is also great for those who wear bifocals or have minor vision issues, as it is a marked enhancement over basic iron sights without changing the basic operation. You’ll also enjoy glare reduction thanks to a friction-fit rear angle to prevent the sight from capturing unwanted light. While the main material used is polymer, the tritium is housed in a steel casing, ensuring good durability and longevity. Lastly, this sight is perfect for all models of Glock. As this will appeal in particular to those who need, rather than want, these enhancements, that’s a nice bonus, ensuring you’ll be able to standardize your arsenal. And at a reasonable price point, why not do exactly that? Perfect for those with poor vision or who wear bifocals, the Ameriglo Glock Ghost Ring is an any-condition solution for gun owners who like traditional iron sights but demand greater performance and accommodation. Easily Adjustable Windage and Elevation. For Glock owners who want a truly customizable and optimized targeting solution, a holographic sight is a great bet. Instead of your typical red dot, holographics introduce the ability to incorporate a range of different reticles. In general, these reticles are incredibly precise, sometimes as small as a pinhead. You’ll enjoy a greater field of view thanks to a wide heads-up display. 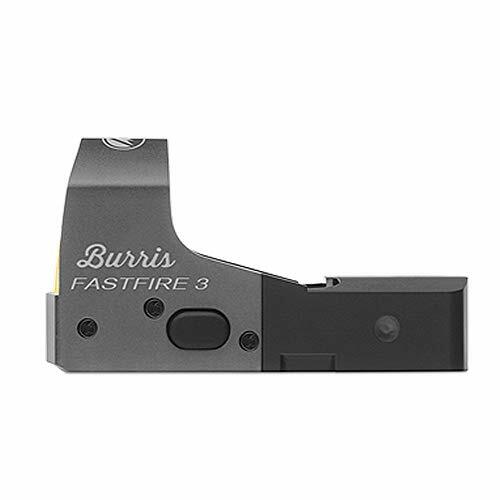 The Burris 300234 Fastfire III is the best of the bunch. Featuring a precise three MOA dot reticle and a bright view without parallax, it is a joy to use. An auto-control allows you to focus on shooting without the issue of fiddling with brightness. All this leads to fast target acquisition and much-improved accuracy. You’ll notice a great improvement at any range—dead-on precision is a piece of cake up to 25 yards and results are markedly improved at double that. Some great features set this holographic sight apart from the competition. First, windage and elevation are easily adjustable without the use of tools. Doing so is incredibly easy. Secondly, the battery compartment is easily accessible at the top of the unit, making replacement a 20-second task. You can also purchase this sight in an eight MOA dot variation, and both the three MOA and eight MOA are available with or without a Picatinny mount. Regardless, you’ll enjoy a solid steel construction and smudge-resistant glass. Overall, this is an excellent holographic sight that will immediately improve your precision. Holographic sights can get incredibly expensive, but the price here is comparatively low, making it a good value. When it comes to holographic sights, many shooters feel that the improved accuracy and precision almost makes it feel like cheating. Often prohibitively expensive, holographic sights are within reach thanks to the Burris 3000234 Fastfire III. As we’ve stated before, Trijicon is one of the top choices for both local and federal law enforcement. Thanks to this wide support, whenever you see a Trijicon product, you know that it will be a high-quality item at a reasonable price. Does the great value of the Trijicon night set for the .22 carry over to the 43? You’d better believe it. You get the same glow-in-the-dark photoluminescent paint and tritium-filled glass lamp. A U-notch rear sight helps improve focus on the front sight. The rear sight is angled to minimize glare. These sights are also available in three sets. Bright & Tough, HD, and HD XR are again your options. To refresh, Bright & Tough does not have photoluminescent paint or an angled rear, whereas the HD does. HD XR offers a thinner front-sight post, increasing your field of view. These three options enable you to choose what most suits your needs. Generally, we think the HD XR model provides the best optics, while the Bright & Tough provides the best versatility and is the most “classic” sight experience, which is why it’s the standard issue for many law enforcement agencies. There are color options available for each type, so you can choose whichever outline color is preferred. This is a good option for colorblind gun owners or those who have difficulty focusing on different colors. With a wide range of options, excellent versatility across lighting conditions, and a record as a reliable and affordable choice, Trijicon continues to win us over! Trijicon’s sights are a favorite of law enforcement. Affordable, reliable, and excellent across all lighting conditions, it’s easy to see why. If you’re looking for a laser sight to fit for your Glock 43, look no further than the Crimson Trace LG-443. With a powerful 5mW peak, 620-670nm, Class 3R red laser, it’s the bright beam that you can buy. Not just because it’s the brightest, but because it’s the highest legal brightness available. It’s a truly unique, instinctive activation that sets Crimson Trace apart, though. A front-activation button immediately engages the laser when you hold your Glock in a typical firing grip. This means three things: improved battery life, improved discretion, and efficient targeting. Speaking of battery life, you’re probably thinking such a powerful laser means the battery dies quickly. Not so! Somehow, Crimson Trace has managed to squeeze four hours out of the battery, which is shocking for such a powerful beam. Not only that, but Crimson Trace offers a “Free Batteries for Life Program.” Considering it takes an included 1/3N battery, that’s a welcome bonus. No need to hunt down a specific battery or search for them online! While factory-sighted at 50 feet, windage and elevation are adjustable with an included tool. Speaking of tools, it comes with everything you need and is a breeze to install. 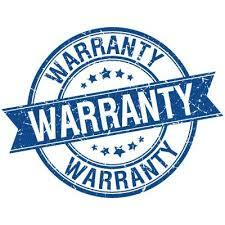 Should you ever have problems, a three-year manufacturer warranty has your back. If you want a powerful laser, excellent battery life, free batteries for life, and a solid warranty, invest in a Crimson Trace LG-443. 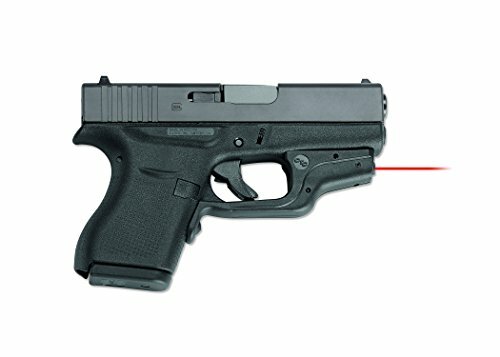 Unless it’s outside of your budget (and we should note that it’s by no means expensive), it’s hard to find faults with the Crimson Trace LG-443. With tons of amenities and the most powerful laser available, it’s should be the go-to option. Looking to improve your nighttime performance with a Glock 42 or 43? Day or night, get the best targeting possible without the use of batteries or light exposure. 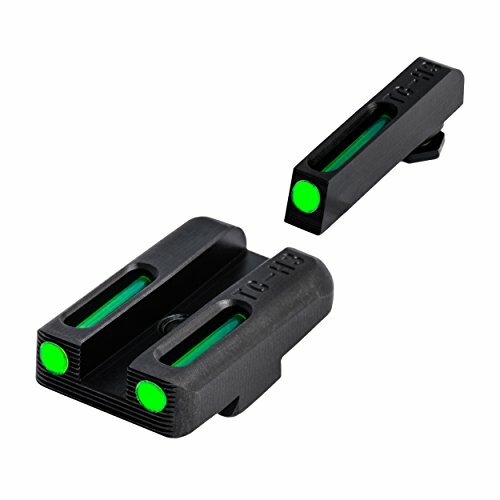 Thanks to a combination of fiber-optics and tritium, you’ll get glow-in-the-dark sights, available in green or yellow for the rear while the front is a standard green. We suggest yellow for the rear, as yellow increases nighttime contrast and helps better focus on the front green sight. With the combination optics, you’ll enjoy lightning-fast targeting, day or night. The optics are also concealed, which helps prevent your target from seeing the glow and also helps prevent the sight from snagging on holsters. Meanwhile, CNC-machined steel means this sight will last for a long time and withstand whatever you throw its way. Obviously, Truglo knows their sight will last a long time, which is why you also get a 12-year warranty. This is one of the longest warranties we’ve seen on a sight that isn’t an outright lifetime warranty. Did we mention this is all available at a low price? If you’re looking for a solid night sight for your Glock 43, Truglo has made a truly trusty companion for your consideration. With durable construction and a 12-year warranty, the Truglo TFO Handgun Sight Set is a perfectly reliable companion for your day or night shooting. It’s time again to look at our OEM solutions for the Glock 42 or 43. Don’t dismiss OEM sights, as sometimes factory sights are preferable. Massed produced on a large scale, they’re often very affordable. Wise Glock users will own at minimum one OEM set of sights. Why? They’re an affordable backup should something ever happen to the sights you use regularly. Also, there isn’t just one type of OEM sight. 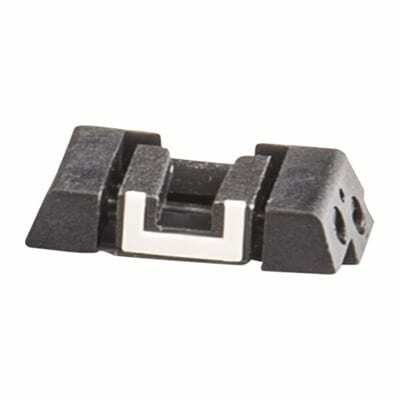 Not only could your current Glock factory stock be outdated, but this sight is a rear night sight. It is also a slim sight, at only 6.1mm. 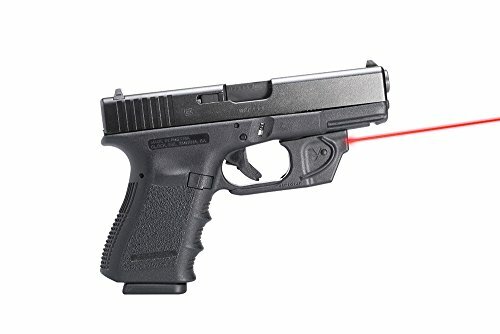 If you’re dealing with factory sights that are leaving you hanging in low-light conditions, these factory sights direct from Glock are a big improvement over what you’re already dealing with. They also mean you won’t have to adjust to a new sight, so if you’re perfectly fine with your existing sight but want nighttime shooting to be more feasible for you, this is your best bet. Plus, factory replacement sights are the easiest to install. You’ll find no shortage of support for them, either. They’re available just about everywhere and gunsmiths know them inside and out. 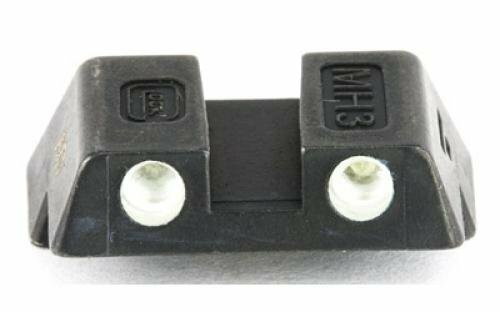 If you need a low-cost, simple upgrade over your more limited and older model Glock stock sights, or want peace of mind in keeping spares, don’t neglect the thought of buying some basic factory sights. If you want an incredibly affordable upgrade to your basic OEM Glock sights, buy the Glock-made solution. Makes an excellent backup in case others fail, too. You’ve just purchased your new sight and can’t wait to install it on your Glock. Before you bust out the tools, consider an installation tool. Designed for installing, removing, or adjusting any model of Trijicon Glock sights, the use of an installation tool means you don’t need to fear damaging your sight or your Glock. But there’s more to it than that! 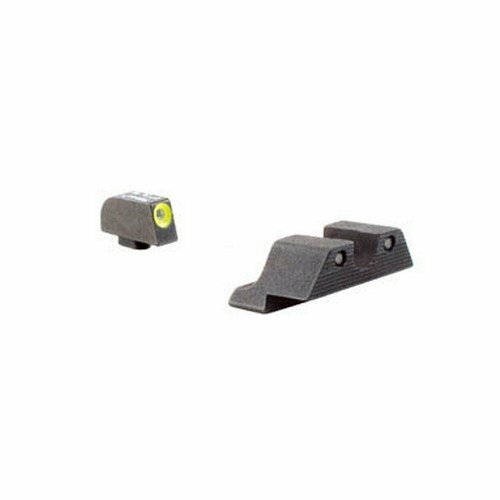 With a heavy-duty rear sight mover and oilite bushings, you’ll enjoy incredibly fine windage adjustments as well as a front sight nut driver for all models of aftermarket front sights. Skip the hassle and use a tool such as this to replace your sights in mere minutes. Commonly-used tools like punches can easily damage tritium sights. Of course, those new to modifications are much more likely to break their parts, making an early investment in an installation tool a wise investment. You don’t need to be an expert to use this tool safely, as it is custom-made to safely do the work for you. In case you were wondering about the durability of the tool itself, have no fear. Made from solid metal with a smooth, effortless operation, it will last you through countless installations. Unless your budget forbids it, the Trijicon Sight Installation Tool for Glock is a must-have for making installations simple, fast, and safe. Now that you know what sight you want to improve your accuracy, it’s time to learn how to install it. Read on for the details, and refer to our video as a visual guide while you work. Remove the magazine and ensure the gun is not loaded. Pull down the slide to the rear. Point the muzzle away from you and pull the trigger. Place your hand over the beavertail and pinch the slide back a little. With your other hand, pull down the takedown lever, and the slide will come off the front of the frame. Use a hex tool to remove the front sight. The rear sight is a dovetail. We strongly recommend using the above-mentioned Trijicon installation tool as opposed to a punch. Center the sight pusher block and loosen the sleeve, knob at the bottom. The Glock rails will fit on the sleeve. Tighten the bottom knob. Twist the T-handle until it’s out of the dovetail. Now, loosen the bottom knob, sliding the rails off from the sleeve. Put the front sight into the slide, dot facing the rear, and screw in the front sight. Put the new rear sight in the dovetail and slide the rails back on the sleeve and tighten the bottom knob. Twist the T-handle and center the sight as best as you can. Now, just reassemble the gun: drop the barrel in, followed by the recoil spring, and slide the rails on the frame. Pull back and you should hear a click of the takedown lever. That’s it! Enjoy the improved performance of your new sight! Whether you’re looking for improved accuracy, better performance in all light conditions, or better durability than your stock sights, improved after-market sights offer a variety of great features for any type of Glock owner. With options for every budget, there’s no reason to stick with the inferior sights you’re used to. Don’t limit yourself and take your shooting to the next level. We’ve shown you the best sights for every type of Glock owner, as well as how to install your new sights. Follow our guide carefully to up your game without damaging your Glock or beautiful new sight!